Welcome to our website. We hope you find it informative and useful. It aims to give you a brief outline of meditation from within the Christian tradition and keep you up to date on the activities of Christian Meditation Ireland. We are men and women from all walks of life who come together to share and express a desire for deeper meaning in our lives through meditating together. Throughout Ireland there are groups which meet to meditate weekly in homes, parishes, offices, hospitals, prisons, schools and colleges, in a spirit of openness and sharing with all. We welcome those of all Christian traditions, of other religious traditions and of none. The governing body of the community is Christian Meditation Ireland Ltd, a not-for-profit company with charitable status, with a voluntary board of directors and no paid employees. 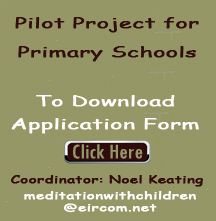 Our aim is to animate and support the practice of Christian meditation in Ireland by communicating and nurturing the teaching and practice of the tradition. [Company Registration No. : 530525 Registered Charity No. : 20082349]. The Memorandum and Articles of Association may be downloaded here. The Covenant with WCCM may be downloaded here. Please click here for the current Governance Manual of Christian Meditation Ireland. The Annual Forum will take place on Saturday, the 4 May 2019 from 11 a.m. to 1 p.m. at the Gresham Hotel, Dublin and will be followed by the AGM at from 2-2:30 p.m.. Registration, tea and coffee will be available from 10:30 a.m. The day will start with a welcome by The National Coordinator Noel Keating and include a short talk by a visiting speaker, two meditation sessions, a financial Report from the Hon Treasurer & Company Secretary, and reports from Board members. It will be followed by the AGM. There is no fee for this event, but a charge of €10, payable on the day, will apply for the lunch supplied by the hotel of Soup & Sandwiches, Tea/Coffee. Advance booking is essential as the hotel needs to know, before the 20 April 2019, the number attending for preparation of the room and the number for lunch for catering purposes. All who practice Christian Meditation are warmly invited to attend this forum. Full participation is invited from the attendees with their comments and suggestions. Meditation Retreat: 'Mindfulness in the Christian Tradition' facilitated by Marian Burke. Click here for more information. A day of talks and meditation will take place in Cork on Sat, 18 May 2019. Led by Fr. Donagh O'Shea, the day will run from 10 a.m. to 4.30 p.m. The venue will be at St. Dominic's Retreat House, Ennismore, Montenotte, Cork Cost €25 to include Tea/Coffee and Lunch (an not at the usual venue). Due to limited seating capacity, and the need to know numbers for lunch, booking and payment essential before sat. 20th April (Holy Saturday). To book contact Rowena O'Sullivan, 'Little Orchard', Farranleigh Pk., Cork. Enquiries also to Rowena 087.1331038. Annual Retreat (15 June 2019) Theme - Meditation: That mysterious silence where the true-self can be discovered'. Our annual retreat this year will take place on Saturday, 15 June 2019, in the Talbot Hotel, Stillorgan. Our speaker will be Fr Donagh O'Shea. The day will begin at 10 a.m. with Registration/Tea & Coffee from 9:30 a.m. and will conclude at 4 p.m. As usual, the day will include a number of talks on aspects of Christian Meditation interspersed with periods of silent meditation under the theme 'Meditation: That mysterious silence where the true-self can be discovered'. Early booking is strongly advised. For booking please contact: Eithne White 086-8176655/ 01-2882659 or email eithnewhite12@gmail.com or by post to Eithne White, 12 South Hill Park, Booterstown, Co. Dublin, A94 YP02. Christian Meditation Ireland wishes to announce a unique event for Christian Meditators in Ireland. We are organising a week-long School Retreat from Mon 26Aug 2019 to Mon 2 September 2019 in Mallow, Co. Cork. This is a week-long residential intensive retreat, which will be led by Fr Laurence Freeman, provides a rare opportunity to benefit from the sustained silence and stillness of meditation over an extended period. It is suitable for people who have been meditating seriously for some time in our tradition, be familiar with the Essential Teaching of the Community and have some experience of integrating meditation into daily life. This retreat is an opportunity to grow in the silence and stillness of meditation over a week. Participants commit to the whole week, arriving in good time for the start of the retreat. Each day there will be eight sitting meditation sessions, without readings or music, with contemplative walking sessions between them. A short teaching in the morning and a contemplative Eucharist help the silence reach its full potential. This is a rare opportunity to go significantly deeper in the work of silence. It is not a time for study or extensive reading. Participants practice a digital fast and do not use phones, emails or computers so that all can be fully present together without such distraction. (There will be an emergency number by which participants can be contacted should that be necessary). The retreat will be based at Clonmeen House, Mallow, Co. Cork. Des & Kathy Sheehy have generously made their beautiful home available to Christian Meditation Ireland for the event so we have been able to keep the cost to €725, including accommodation, all meals and coffee breaks and the retreat. Numbers may be limited to 12, otherwise we will need to book additional accommodation available on the same site which would accommodate a further nine persons. That supplementary accommodation will need to be reserved by CMI within the next 8 days so we urgently need to know whether we will need to book the additional space. A non-refundable deposit of €325 will be required to secure a place. Payment may be made by cheque payable to Christian Meditation Ireland and posted to Niall or by bank transfer to our bank account: Christian Meditation Ireland, AIB, Main Street, Blackrock, Co Dublin. IBAN: IE13 AIBK 9336 7811 7510 32, BIC: AIBKIE2D. If making an online payment (bank transfer) be sure to include the reference code SRAUG19 and your name and remember to also email Niall to confirm your booking and to let him know payment was made online. Perhaps the simplest way to learn about Christian Meditation is to join a group near where you live. However, that is not always possible. The World Community for Christian Meditation (WCCM) has an online School of Meditation which gives paid access to a number of online courses that may be helpful to those who are seeking information on Christian meditation or who want to deepen their knowledge and practice and who, for one reason or another, are unable to attend a weekly group. Click here to find out more. An Irish Newsletter will appear quarterly, primarily in digital form and will be emailed out to group leaders who can print copies for their groups or share the link as it is downloadable from the Irish Newsletter page. Those who specifically want a printed copy can contact Theresa Hobbs in the CMI secretariat (086-1621803; email theresawccm@gmail.com) to have it posted for a small fee.